White rhinoceroses actually are grey. Southern white rhinos benefit from conservation. But northern white rhinos may be extinct already in the wild and before long in captivity. Northern white rhinoceroses (Ceratotherium simum cottoni) currently are not among the Northern Hemisphere’s native or naturalized wildlife. They instead call home the Southern Hemisphere’s African continent. • Nowadays they do not inhabit any part of Africa’s northern half. • They in fact exist only as rare, tenuous, vulnerable relicts in captivity on the 90,000 acres (364.22 square kilometers) which form Laikipia district’s not-for-profit Ol Pejeta Conservancy in central Kenya. There, they find among the wildlife conservancy’s permanent populations fellow African black rhinoceroses (Diceros bicornis). • But color has little relevance when differentiating the two African natives. • Black and white rhinos respectively look brown-grey and grey. The two rhinos nevertheless share imperiled existences. Northern white rhinos in particular totter toward extinction. Rhinoceros simus cottoni: illustration by J. Terrier; lithography by J. Pitcher Ltd. The white rhino’s square-lipped, wide muzzle. Whatever the real reason, all of the above-mentioned suggested explanations relay the grazing, wallowing essence of white rhinoceroses. John Edward Gray (February 12, 1800 – March 7, 1875): British zoologist is credited with assigning genus name, Ceratotherium, for White Rhinoceros. Binomial (“two-name”), Greco-Latin, scientific names likewise attempt to highlight what makes organisms distinct and memorable. They can -- or cannot -- make sense in original or translated forms. They do emerge as particularly apt for northern white rhinoceroses. The genus name, Ceratotherium (“horn-beast”), draws upon Walsall-born British physician and zoologist John Edward Gray’s (February 12, 1800 – March 7, 1875) expertise. The species name, simum (“flat-nosed”), is thanks to Fulham-born English artist and naturalist William John Burchell (July 23, 1781 – March 23, 1863). The trinomial (“three-name”) nomenclature owes the subspecies name, cottoni, to London-born English geologist and naturalist Richard Lydekker (July 25, 1849 – April 16, 1915). The taxonomic ensemble stresses the rhino’s “nose-horn” (ῥῑνο- [rhino-] -κέρας [-keras]) quintessence. William John Burchell (July 23, 1781 - March 23, 1863): English explorer and naturalist is credited with assigning species name, simum, to Northern White Rhino. Remain an only calf for 2 – 3 years before establishing independent home and territorial ranges. 10 – 12 years through dominating offensive and self-defensive charging, horn-fighting, roaring. Weights of 3,747.86 pounds (1,700 kilograms), 5,070.63 pounds (2,300 kilograms). Water bodies to remain hydrated. Former native range of Northern White Rhino formerly encompassed eastern Central African Republic, southern Chad, northeastern Democratic Republic of the Congo, southern South Sudan, and northwestern Uganda. Land and water abound throughout Africa. Natural resources are sufficiently plentiful to sustain all of the continent’s diverse life forms. Their allocation historically does not pose problems in wild contexts since no animal traditionally challenges northern white rhino life expectancies. Northern white rhinos indeed fear no wild predators -- not even hyenas (Crocuta crocuta, Hyaena spp) and lions (Panthera leo) -- since mothers charging, horn-fighting, and roaring protect the young. But in captivity, they nowadays have to re-learn tolerance of human presences. Those that questionably may survive in the wild make every effort to avoid human detection. Northern white rhinos in fact recognize flesh-, horn-, traditional medicine-, and trophy-poachers as far as 2,624.67 feet (800 meters) away. The detriment of native fauna and flora. Anthony, Lawrence; and Spence, Graham. 2012. 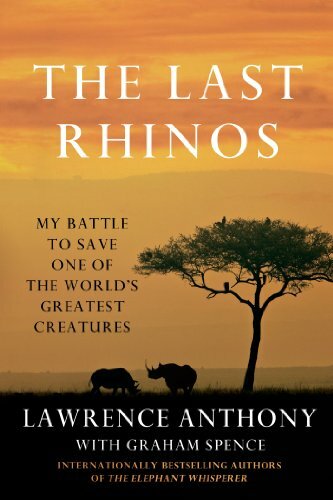 The Last Rhinos: My Battle to Save One of the World’s Greatest Creatures. London, England: Sidgwick & Jackson; and New York, NY: Thomas Dunne Books. Bass, Rick. 2012. The Black Rhinos of Namibia: Searching for Survivors in the African Desert. Boston, MA: Houghton Mifflin Harcourt. Brumfield, Ben. 20 October 2014. “Countdown to Extinction: Only 6 Northern White Rhinos Left on Earth.” CNN.com: U.S. Edition > World > Africa. Atlanta, GA: Cable News Network, Turner Broadcasting System, Inc. Retrieved November 5, 2014. Carson, Mary Kay. 2007. EMI and the Rhino Scientist. Boston, MA: Houghton Mifflin. "Ceratotherium cottoni: Northern White Rhinoceros." Encyclopedia of Life. Retrieved November 5, 2014. "Ceratotherium simum: White Rhinoceros." Encyclopedia of Life. Retrieved November 5, 2014. Dell’Amore, Christine. 20 October 2014. “Extremely Rare White Rhino Dies in Kenya -- His Kind Nearly Extinct.” National Geographic.com: News > Animals. Washington, D.C.: National Geographic Society. Retrieved November 5, 2014. Groves, Colin P. Groves; Prithiviraj Fernando; and Jan Robovský. 2010. "The Sixth Rhino: A Taxonomic Re-Assessment of the Critically Endangered Northern White Rhinoceros." PLoS ONE 5 (4): e9703. DOI: 10.1371/journal.pone.0009703. Retrieved November 5, 2014. Heller, Edmund. 1913. The White Rhinoceros. With thirty-one plates. Smithsonian Miscellaneous Collections, Volume 61, Number 1, Publication 2180. Washington DC: Smithsonian Institution. Holmes, Mary Tavener. 2007. My Travels with Clara. Los Angeles, CA: J. Paul Getty Museum. Joubert, Beverly; and Joubert, Dereck. 2009. Rhino Rescue. Produced by Wildlife Films Botswana for National Geographic Channel. Washington, D.C.: National Geographic Society. Lydekker, R. (Richard). 1908. The Game Animals of Africa. London: Rowland Ward Limited. Orme, Helen. 2007. Rhinos in Danger. New York, NY: Bearport Publishing. Owen-Smith, Norman. 1975. "The Social Ethology of the White Rhinoceros." Zeitschrift für Tierpsychologie 38:337-384. Owen-Smith, Norman. 2003. "White Rhinoceros: Ceratotherium simum." Pp. 261-262 in Grzimek's Animal Life Encyclopedia, 2nd Edition. Volume 15, Mammals IV, edited by Michael Hutchins, Devra G. Kleiman, Valerius Geist, and Melissa C. McDade. Farmington Hills, M: Gale Group. Spilsbury, Richard. 2004. Black Rhino: In Danger of Extinction! Chicago, IL: Heinemann Library. Tibbitts, Alison. 1992. 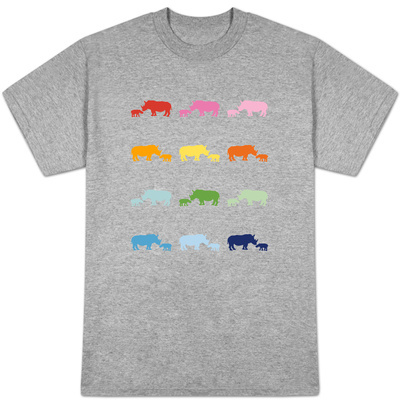 African Rhinos. Mankato, MN: Capstone Press. Tjader, Richard. 1910. The Big Game of Africa. New York and London: D. Appleton and Company. Van Gyseghem, R. 1984. "Observations on the Ecology and Behaviour of the Northern White Rhinoceros." Zeitschrift für Tierpsychologie 49:348-358. Watt, E. Melanie. 1998. Black Rhinos. Austin, TX: Raintree Steck-Vaughn. “White Rhinoceros (Ceratotherium simum).” National Geographic.com: News > Animals. Washington, D.C.: National Geographic Society. Retrieved November 5, 2014. “White Rhinoceros.” WWF.Panda.org: What We Do > Priority Species > Rhinos > African Rhinos. Gland, Switzerland: World Wildlife Fund. Retrieved November 5, 2014. When Lawrence Anthony learned that the Northern White Rhino was on the very brink of extinction, he knew he had to act. If the world lost the sub-species, it would be the largest land mammal since the woolly mammoth to go extinct. 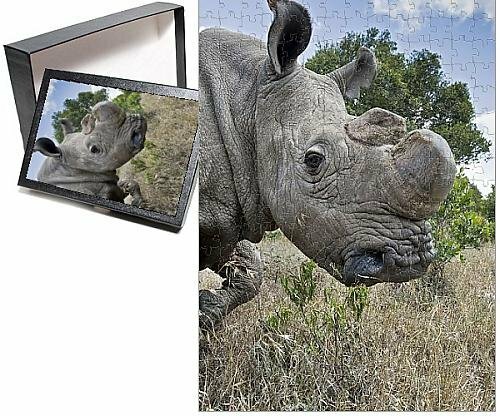 10x14 Photo Puzzle with 252 pieces. Packed in black cardboard box 5 5/8 x 7 5/8 x 1 1/5. Puzzle image 5x7 affixed to box top. 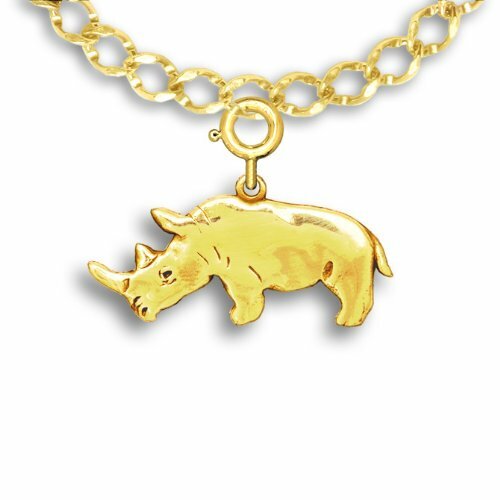 Unique 14K gold jewelry design made in America by Magic Zoo Artist Merry Rosenfield, who notes: "I created this piece with respect and the hope that the wild rhino will continue to roam it's habitat for as long as the earth turns on it's axis." Found only on Hawaiian island of Moloka'i, Paroreomyza flammea, known as the Moloka'i creeper, has not been sighted since the 1960s. Is this scarlet creeper rare (safe) or extinct?